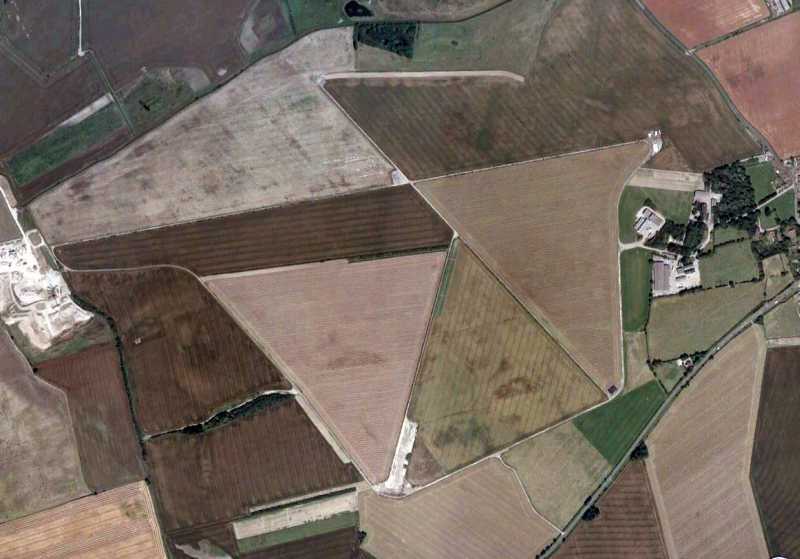 Lissett airfield (RAF Lissett) was an airfield 280 kilometers north of London. The airfield was built in 1942 as a Class A bomber airfield for Bomber Command's No.4 Group, featuring 36 pan-type parkings and two T2 hangars. 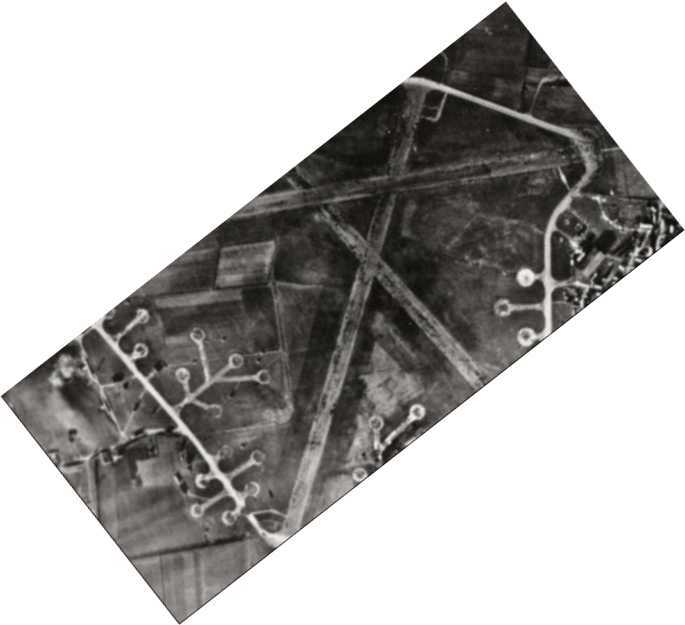 Facilities dispersed around the airfield were capable of handling 1800 personnel. The first unit at the airfield was 158 Sqn, originally a Halifax bomber unit from RAF Rufforth. The squadron participated in main force operations during 1943 and at the end of that year, its C-flight was used to form a new squadron to be based at RAF Leconfield. The squadron continued to operate until the end of the war and participated in 250 raids during which it lost over 140 Halifaxes from crashes or enemy fire. Their final operation was flown two weeks before the end of the war. 158 Sqn was transferred to Transport Command on 7 May 1945 (VE Day) and began to convert to Stirling Mk V. transports. When the squadron was ready for their new role, they moved to RAF Stradishall. Lissett was then put on Care & Maintenance status with only a small caretaker staff remaining. Care & Maintenance ended by the end of the year and the airfield was abandoned. Partial overview of the airfield (LissettVillage.com). 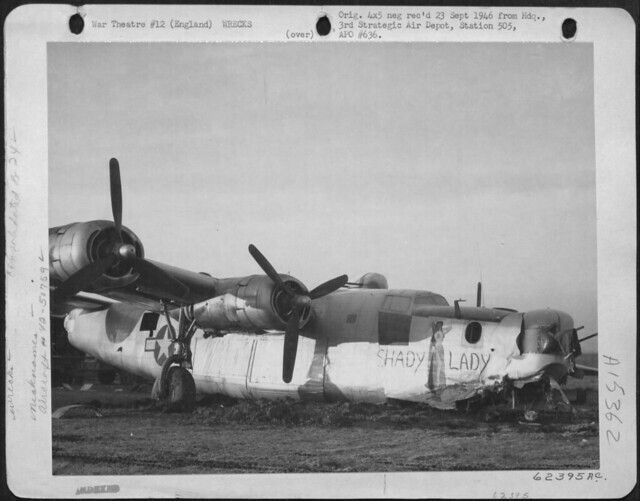 Consolidated B-24J-1-FO Liberator "Shady Lady" (42-50759) of 715th Bomb Squadron, 448th Bomb Group, 8th Air Force, skidded off the runway at RAF Lissett on 16 November 1944. She was salvaged later that week. (B-24 "Shady Lady" on Flickr). 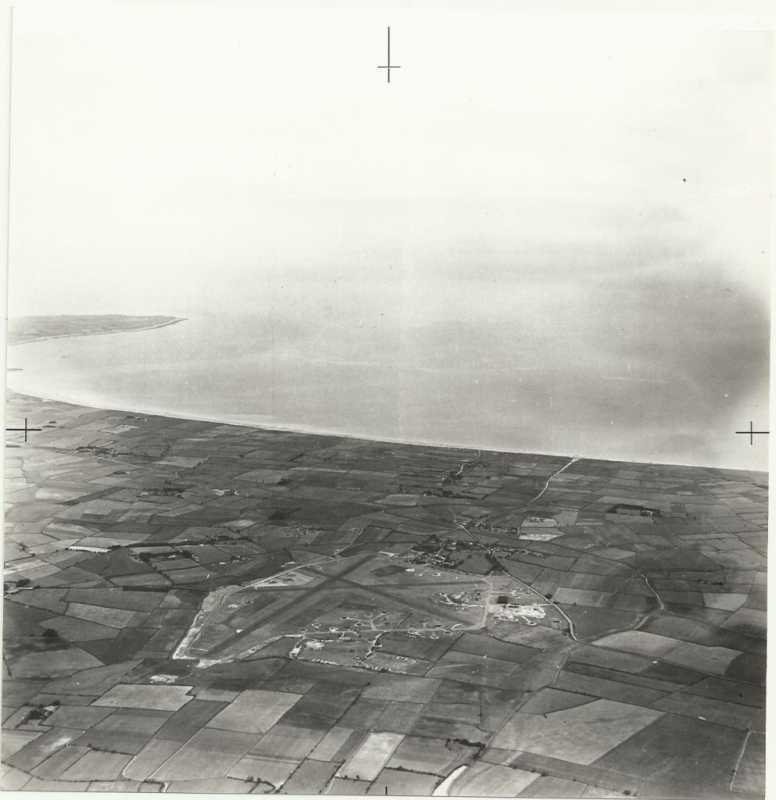 RAF Lissett looking east towards the North Sea (AirfieldInformationExchange). By the 1970s most of the concrete had been removed. The former technical site buildings were used by small industrial firms and for farm storage. By the turn of the century very little remained to indicate there ever was an airfield at Lissett. In December 2008 a 30 MW wind farm housing 12 turbines each 125 metres (410 ft) high was constructed across the western end of the airfield. A memorial sculpture to 158 Squadron in the form of seven airmen has been erected to the memory of the 851 airmen who did not return from operations at the airfield. 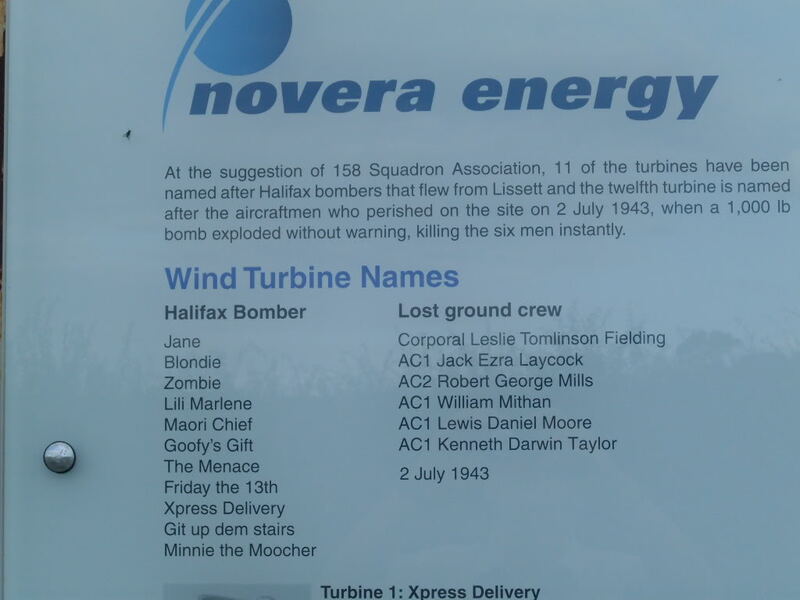 The wind turbines were named in honour of the crews that operated from the airfield. 2002 overview of the airfield (Google Earth). The memorial erected at Lissett in 2008 (Wikipedia). 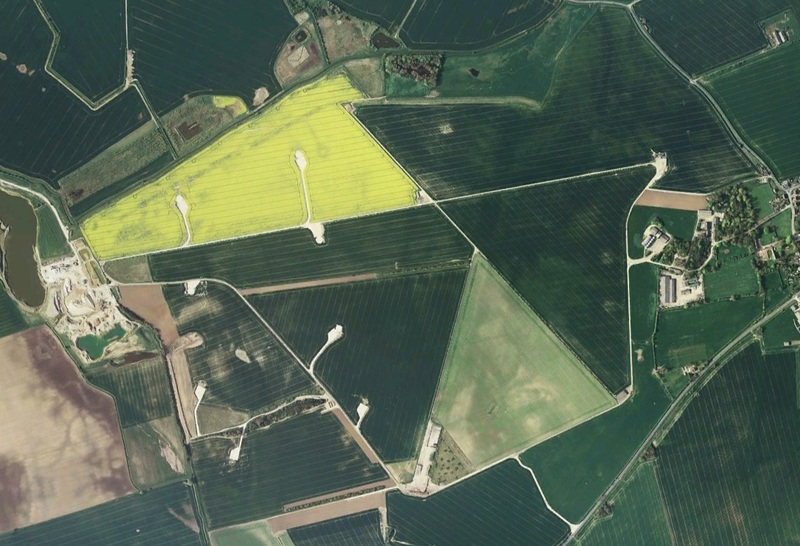 2007 overview of the airfield, showing the preparations for the placement of the windturbines (Google Earth).